These days, finding a low mileage fourth-gen F-Body that’s been cared for is rear. The market seems to be flooded with parts cars and cars on their last leg. It’s refreshing when one comes to our attention that the owner has genuinely cared for (don’t get excited, it’s not for sale) and has maintained over the years. This is the case with Trevor Blair’s nicely modified street car, a 2000 Pontiac Trans Am. Trevor always loved Trans Ams thanks to the influence of the Knight Rider series staring KITT (Knight Industries Two Thousand) a modified 1982 Pontiac Trans Am. He would go on to make his own Knight Rider conversion, and when that project was finished, he decided it was time for a 4th-gen LS1 powered Trans Am. The hunt began for his LS1 car in September 2004, and he wasn’t picky about what he was looking for, he just wanted it to be a fourth-gen Trans Am. Trevor didn’t care about the color, or whether or not it was equipped with the WS6 package, his only requirement was that it was a T56 six-speed manual transmission car. Not that getting a WS6 wouldn’t have been great, but back in 2004, the prices were still pretty high, even the base models were selling for quite a bit. As a guy in his 20s, Trevor didn’t have a huge budget, so he had to make sure he spent it wisely and find a car at a great value, and his patience would prove to pay off. It was at his local dealership when the car he had been waiting for would show up. 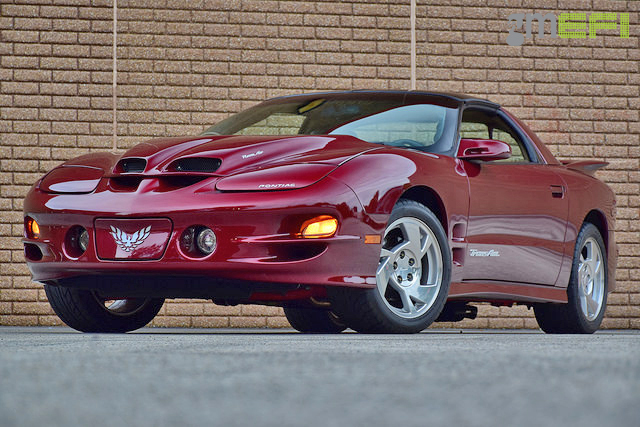 Priced at $14,500 with only 44,000 miles on the clock, a base model Maple Red Metallic Trans Am with Taupe interior, Hurst shifter, 6-speed transmission, and chrome 16” wheels was calling his name. Once he got it home, he started in on the basic modifications and also got an American Sport Car Design WS6 hood right away, accompanied by a SLP air lid. Now that it had the WS6 look he liked, he would give the car its great sound with a GMMG catback exhaust system. Even though the car had a slight boost in pep from the air lid and exhaust, Trevor wanted more power, and a set of Kooks long-tube headers and catted Y-pipe would get him on his way. Now that it had a little more response in the pedal, he decided to keep on with the WS6 conversion and picked up a set of 17” WS6 Sportline wheels from a 1999 car. They were stored in a closet until he was able to mount them. During this time, he worked with someone who bought a 2000 black WS6 Trans Am that had the infamous Salad Shooter wheels. After talking with his co-worker, he found out that the guy hates the N66 wheels and wanted some five-spoke wheels instead. Trevor offered up his wheels for trade, and the guys had a deal they were both happy with. After having his Trans Am for a little while, Trevor noticed the internet blowing up about “cam only” LS1 builds, and after seeing the results posted everywhere online, he wanted to get in on the craze. He picked out a Texas Speed TSP Torquer V3 cam, and had decided that “cam only” was as far as he wanted to take it. During the installation of the camshaft, a stubborn lifter would cause some issues, so instead of letting it fall into the oil pan, the intake manifold and heads would come off to fish it out. With the intake and cylinder heads already off, it became a “why not?” situation, so he called Texas Speed again to get a set of 5.3L Stage 2-1/2 heads on the way. He also got a Vengeance Racing ported FAST 90 intake and Nick Williams throttle body. The top end modifications netted him a 445 rear wheel horsepower dyno pull and a 12.19-second E/T quarter-mile pass at 119 mph. A few things have changed since the initial setup. The catted Y-pipe has now been replaced with a Speed Inc X-pipe, and Flowmaster 10-series one chamber mufflers have been added. He’s also got a Textralia OZ700 clutch, and upgraded the suspension with a set of UMI tubular control arms, Viking double adjustable shocks at the front and Strange single adjustable shocks out back, a UMI K-member and solid motor mounts, a Midwest Chassis torque arm, a UMI tubular panhard bar, and UMI subframe connectors. Knowing the 10-bolt was the weakest point on the car, he called Eric at Midwest Chassis to get a Fab 9” with 35-spline axles and 4.11:1 gears. That combined with a set of Mickey Thompson ET Drags wrapped in Weldstar R/T track wheels would get his quarter-mile time down to 11.41-seconds at 122.3 mph while cutting a 1.62 60’. Trevor would like to thank Tyler MacAdam for his help with the heads/cam swap, noting that the car would probably be bolt-on only still without his help. He also wants to thank Greg Huff for all his help with the driveline work. And of course, like any good car obsessed husband, he wants to thank his wife Laura for her support through the madness. SUSPENSION: UMI tubular control arms, Viking double adjustable shocks at the front and Strange single adjustable shocks out back, a UMI K-member and solid motor mounts, a Midwest Chassis torque arm, a UMI tubular panhard bar, and UMI subframe connectors.